Comprehensive Survey of Newhall and Contiguous School Districts (Castaic, Saugus, Honby, New Era, Felton) by Lester Dalbey, 1933. AP0729 - S.D. Dill's High School Bus, 1918. 1933 Fourth of July Parade and Homecoming; Dedication of Newhall School Playground News reports, 1933. NS6001 - Classroom Rental and Lease Agreement Between Newhall School District (Lessor) and Hart District (Lessee), 9-1-1960. AP0113 - First Newhall School (1879-1890). AP0124 - First Newhall School, Class of 1884 (grades 1-8). John William Myers: Opened School at Elizabeth Lake; Newhall Schoolteacher 1884-1886. First Newhall School Burns Down News Reports, 1890. Tales from the Newhall School News Reports. HS0731 - Second Newhall School (1890-1914). AP1705 - Second Newhall School (1890-1914). AP1710 - Second Newhall School (1890-1914). AP1011 - Second Newhall School (1890-1914). Photo 1891. AP1708 - Baseball Game at Second Newhall School (1890-1914). RL0100 - Second Newhall School, 1911. RL1401 - Irene Ruiz's Newhall Grammar School Diploma, 1914. RL1502 - Third Newhall School Class Photo, c. 1915. AP0527 - Third Newhall School Class Photo, 1910s. GR0220 - Third Newhall School, Sixth Grade, 1919. KU2501 - Third Newhall School, 2nd Grade, 1925. KU2502 - Third Newhall School, 4th Grade, 1925. Sale, Dismemberment & Private Development of Third Newhall School Site News Reports 1925-1926. Also: School Board Authorized To Sell News Reports 1925. Video - Third Newhall School Site, 1995 (Go to 23:25). LW2638 - Third Newhall School Building Razed, 16 Views, 7-4-2014. Opening of New (Fourth) Newhall School Site on Walnut Street News Reports 1925-1926. 1926 Graduation Ceremony Includes Performances in New Auditorium (Names) News Reports 1926. NS2801 - Student Body, Fourth Newhall School, 1928-1929. KU2902 - Fourth Newhall School, 8th Grade Commencement Program, 5-23-1929. NS3001 - Fourth Newhall School, Quad Area, 1930. PC3201 - Fourth Newhall School, Kindergarten Class of 1932 (Pupils named). PW3301 - Fourth Newhall School, First Grade, 1933. PC3501 - Fourth Newhall School: Thanksgiving ~1935. PC3502 - Fourth Newhall School: Miss Frisbee's Class, December 1935. PC3601 - Fourth Newhall School: Tom Thumb Wedding ~1936. PC3602 - Fourth Newhall School: School Play? December 1936. PC3702 - Fourth Newhall School: Arabian Nights ~1937. PC3701 - Bertha & Emma Blum of Acton; Newhall School Teachers, 1937. PC3801 - Fourth Newhall School, Eighth Grade Graduating Class of 1938. GR0221 - Newhall School Fire, 2-14-1939. Fire Destroys Newhall School, Pupils Rejoice News Reports, 2-15-1939 (fire 2-14-1939). Short History of 1925 Newhall School and Auditorium The Signal, 2-17-1939 (fire 2-14-1939). GR0222 - Newhall School Fire Aftermath, 1939. PC3901 - Newhall School: Patricia Cook's Eighth Grade Diploma, 1939. HG5601 - Arbor Day 1956 Tree Planting at Newhall (School) Park? Measure E Construction Plans & Status, 10-28-2014. LW2534 - Dr. Marc Winger, Superintendent, Newhall School District, 1997-2015. NS1501 - Newhall Elementary School: 2-Story Classroom Building Under Construction, 3-4-2015. Paul Cordeiro, Superintendent, Newhall School District, 2015-2018. Description of Interior of Original Auditorium News Reports 1925-1926. Beautiful Entertainment: School Plays Performed in Newhall Auditorium, 4-19-1929 • The Signal, 4-25-1929. NS9601 - Newhall School Auditorium as Warehouse (Multiple Views), 2-1996. LW3118 - Newhall School Auditorium as Warehouse, Interiors (Multiple Views), 5-1996. Simple Dreams of Good Times at Newhall Auditorium Patti Rasmussen • 11-8-1997. Newhall School Auditorium Rises Anew by Margie Anne Clark • 11-30-2003. 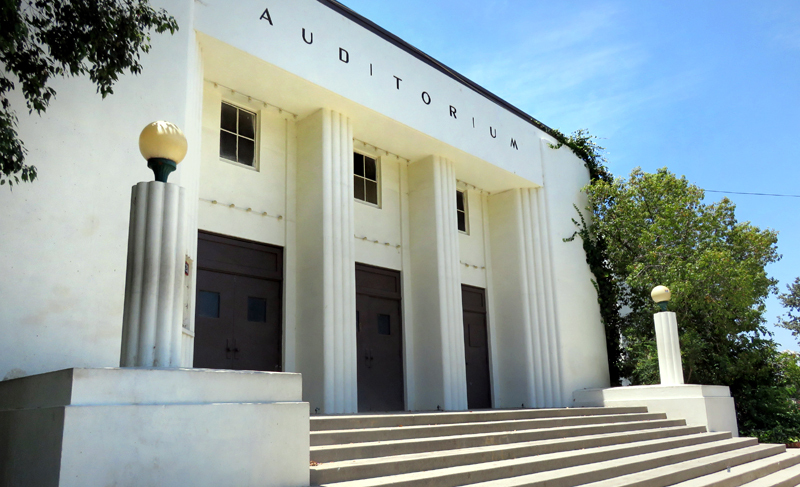 LW2663 - Newhall School Auditorium (Exteriors) 7-15-2014. LW2664 - Newhall School Auditorium (Interiors), 75 Images, 7-15-2014. LW2961 - Newhall School Auditorium Refurbishment, Multiple Views, 2015-2016. Newhall School Auditorium Reborn as SCV's Newest Live Theater (Video) • SCVTV 10-26-2017. Picture Story of Hart High School (and District) • May 1952. GA4501 - 9th Grade Class, Group A (1 of 3), 1945-46. GA4502 - 9th Grade Class, Group B (2 of 3), 1945-46. GA4503 - 9th Grade Class, Group C (3 of 3), 1945-46. GA4601 - Hart ASB Civic Committee, 1946-47. GA4602 - Hart ASB Constitution Committee, 1946-47. GA4603 - Hart High Lettermen, 1946-47. GA4801 - First Graduating Class, 1949 (Photo November 1948). LW2285 - Gwen (Class of 1949) and Dean (1950) Gallion's Class Rings and Other Items. JN5101 - Letterman's Sweater with Original School Colors: Maroon & Gray. AP0815 - A.B. Perkins Addresses Hart High Graduates, 1949. AP1422 - Hart High School Commencement Practice, June 1950. HG5201 - Program Book: Dedication of Henry Mayo Newhall Auditorium (Hart High Auditorium), 9-12-1952. LW2092 - Henry Mayo Newhall (Hart) Auditorium, Postcard, 1950s. LP5401 - William S. Hart Junior & Senior High School, mid-1950s. WR5501 - 8th Grade Basketball, 1955. WR5502 - Varsity Basketball, 1954-55. LW2712 - Pep Club Officers, 1957-58. Tomahawk Yearbook 1958. WR5801 - Varsity Basketball, 1958. WR5901 - Varsity Basketball, 1959. WR5902 - Varsity Basketball Game, 1959. SG6001 - George Harris, C.M. MacDougall & Ronald Reagan at Hart High, early 1960s. LW2708 - Senior Class Officers, Hart High School 1964-65. Tomahawk Yearbook 1965. LW6601 - School Colors: Transition from Maroon & Gray to Red & White. Tomahawk Yearbook 1966. LW6601 - 1966 Wrestling Team. LW3315 - Hart High School Class Photo: Class of 1969. GA7001 - Cecil Sims, Original Hart High School Faculty Member. GA7002 - Hart High School Alma Mater, 1970-71. Remembering Louden Stanford, Newhall's Own John Muir • by Dennis McLane, 2017.